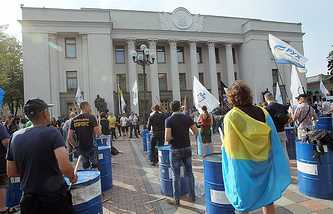 KIEV, September 12. /TASS/. Ukraine’s two leading political opposition forces, the Opposition Bloc and Za Zhittya [For Life] parties are ready for a merger, Sergei Levochkin, a deputy chairman of the opposition caucus in the Verkhovna Rada national parliament said on Wednesday. "I support the consolidated opposition, including a merger with Za Zhittya party, which is led by Vadim Rabinovich and Yevgeny Murayev," he twittered. "I support unification with all the political forces sharing the values of the Opposition Bloc and its electorate, namely, peace, the country’s unity, the progress of democracy and the economy, freedom of speech and freedom of ideas." "I perceive Za Zhittya as one of these forces," Levochkin wrote. Opposition deputy Vadim Novinsky confirmed the intention of the two parties to pool their ranks together. "Consultations on the issue continue for two months already," he told the Levy Bereg [Left-Hand Shore] publication, adding that the parties were not discussing a joint party electoral ticket or the possibility of nominating a common candidate for the presidential election. For the consultations to take the final shape, "it’s important to convene a congress of our party so that it could endorse the necessary decision." Vadim Rabinovich, too, mentioned the plans for a merge of the Opposition Bloc and Za Zhittya earlier on Wednesday. "Yes, it’s true that we’re preparing for unification," he told Ukraina 112 channel. "We must come to terms with each other in spite of the existing big ambitions." Latest opinion polls suggest Rabinovich enjoys the support of 6.7% voters and the opposition politician Yuri Boiko, of 6.4% voters, but the Opposition Bloc occupies the second position in the ranking of Ukrainians’ preferences, with 14% of those polled ready to vote for it. The presidential and parliamentary elections in Ukraine will take place at the end of March and at the end of October next respectively.